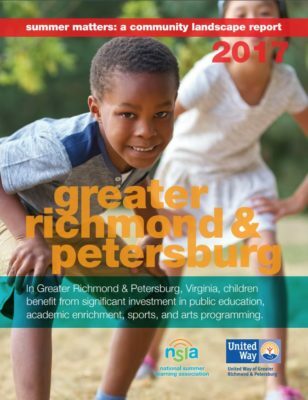 As one of the region’s largest funding organizations, United Way of Greater Richmond & Petersburg is a leader in providing critical information to community leaders and organizations. We have a dedicated research team that studies local data to identify problems in our communities, researches solutions and works with partner organizations to develop solutions that actually move the needle. The Steps to Success don’t pause for summer vacation. In fact, when it comes to education, summer is just as important as any other season. That’s why, in 2017, United Way of Greater Richmond & Petersburg commissioned the National Summer Learning Association (NSLA) to conduct a landscape assessment of summer learning programs in our region. The full assessment is available in a report from United Way and NSLA. Community indicators are vital components of any effort to understand how our communities are progressing in particular areas. By zeroing in on our Steps to Success framework and the data behind each Step, we are better able to both empower individuals and address systemic problems to provide everyone with a clear path to success. This information allows us to gauge progress in each of these nine areas using a series of data points.